As Winston Churchill said, ‘success is not final, failure is not fatal: it is the courage to continue that counts’. 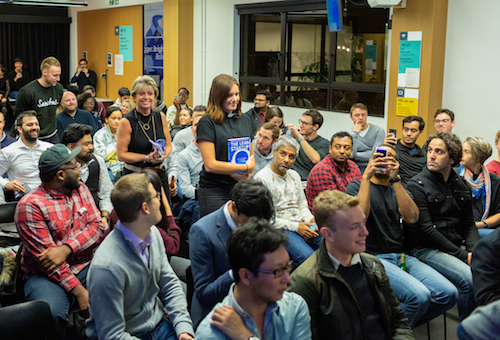 Anyone that came along would know that we have fun with it, we have a ‘minister’ who reads from the ‘Startup Bible’ (aka the Lean Startup), our whole TechHub team is dressed in black, there are RIP signs around the room, and two founders present eulogies in dedication of their failed businesses. The feedback is always phenomenal, with most people telling us it’s their favourite event of the year - there are laughs (and sometimes tears), and a real buzz in the air, full of people sharing their experiences and stories. In short, we love it. The most striking thing though, once the audience gets used to all the fanfair, is the absolute integrity and bravery of the speakers. Generally, it’s hard to recruit people to speak - failure is clearly hard to talk about. We can only thank Penny Power and George Bettany for coming along and being so open. The fact that they were happy to get on stage and share their humbling stories is what makes events like this a success. They both talked openly about their experiences and didn’t hold back at all. They talked about the reality of a business failing, not only from the ‘why’ and ‘how’ it happened, but also about what happened next, the impact it has on your mental health, your relationships, and the choices you make in your life afterwards. “We need to redefine failure. I’ve never felt that I have failed. It’s not me denying stuff, it’s because through the journey I have learnt so much. We fear failure and we fear being broken” says Penny Power, looking back at her experiences, highlighting the importance of the learning curve and the way in which one gets to know themselves better whilst being completely “broken”. The event was raw, honest, and so inspiring that the audience couldn’t keep their eyes off them - how fantastic to see a room so captivated in a world so full of distractions (when apparently people have an attention span shorter than that of a goldfish!). The second most striking thing was the many, many questions from the audience, trying to better understand the signals on when to shut down your startup and move on. It was clear that this event was not only cathartic for the speakers, but genuinely helpful to the audience. “Nobody used it. But we were good at being positive about it. We were trying to create a solution for something that didn’t exist. You need a level where you need to convince people, but you need to check in with reality” was George’s advice, looking back at his journey and making people understand that there’s a time when you need to let your startup go. And the best thing? TechHub is a community of 400 startups, and the message wasn't that ‘you’ll probably fail, get a corporate job, a secure salary and be happy’, but, instead, resonated around tenacity and hard work. Both Penny and George have gone on to set up new, growing and successful businesses. They didn’t see failure as final. They had courage, they learnt, and they carried on. You can find out more about what both Penny and George are doing by following The Business Cafe, and Sanctus. Want to get fast track access to our member event, find a new home for your startup and surround yourself with other technology companies going through similar challenges? Come for a tour!